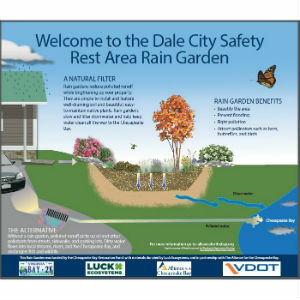 VDOT and the Alliance for the Chesapeake Bay partnered to install a rain garden at the Dale City Rest Area on Interstate 95 south to reduce impacts of stormwater to the Chesapeake Bay watershed and to educate visitors about the importance of protecting groundwater. The 120 square-foot area captures rainwater from a downspout on the rest area building to sustain the garden, which is specially designed to filter out pollutants and reduce runoff as water soaks into the ground instead of flowing over sidewalks and parking lots. When rainwater washes over surfaces such as roofs and driveways, it can carry pollutants, chemicals and other harmful things into rivers, streams and groundwater. Interpretive signage at the site explains stormwater runoff, how the garden works to filter the stormwater and how that benefits local waterways. The garden features native shrubs, grasses and perennials. The Alliance for the Chesapeake Bay designed the rain garden and oversaw construction, and VDOT provided site preparation. The project was funded by a grant through proceeds from the Chesapeake Bay specialty license plate, available from the Virginia Department of Motor Vehicles (DMV). The license plate is a revenue-sharing plate, meaning $15 of the $25 purchase fee goes to the Chesapeake Bay Restoration Fund to restore wetlands, plant buffers around waterways, promote marine life restoration, decrease pollution and provide educational programs.